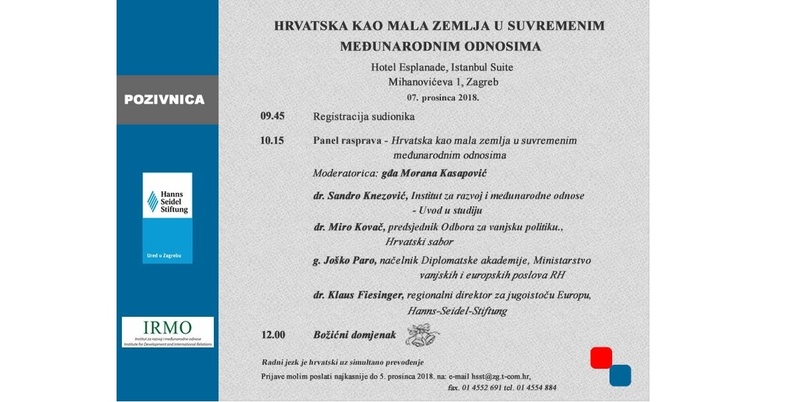 At the final round-table we are presenting the study „Croatia as a Small State in Contemporary International Affairs“, which deals with the vertical analysis of the three levels of Croatia’s foreign policy – regional, European and global. The main aim of this study the analysis of capacity of the small state to actively contribute to EU and NATO policies, having in mind its own national interests and developing a strategic approach towards regional and global powers. The event will last for two hours and will gather representatives of state administration diplomatic community, academia and international organisations. During this year, the Institute for Development and International Relations and the Hanns Seidel Stiftung have organised numerous round-tables on the topic „Small States in Contemporary International Affairs“, where this topic has been analysed from the aspect of influence of big powers in the region of Southeast Europe, small states and global economic influences as well as of the impact of big powers’ specific policies on the small states.